Thirty years after the death of Lieutenant General David Elazar (Dado), his son Yair takes a journey in his father's footsteps. He wants to penetrate the myth surrounding his father's memory, to stop living in his shadow, and to overcome the anger he feels toward his father for always putting the Army first, and then leaving Yair an orphan at the age of ten. Yair seeks out the people who knew his father best, and tries to evoke from them the memories and experiences he missed his whole life. He accumulates all sorts of traces left by his father: archival materials, still photographs, audio tapes and handwritten letters. After many months with this material in the editing room, Yair makes his father come alive. As his journey progresses, Yair realizes that his father did not differentiate the private from the public; The military was his life: A meteoric ascent ending with a painful downfall when he was forced to resign as Chief of Staff. Throughout the process Yair learns to know his father and makes peace with the anger and conflict that had always been with him. He ultimately discovers that telling his father's story has helped him understand himself. 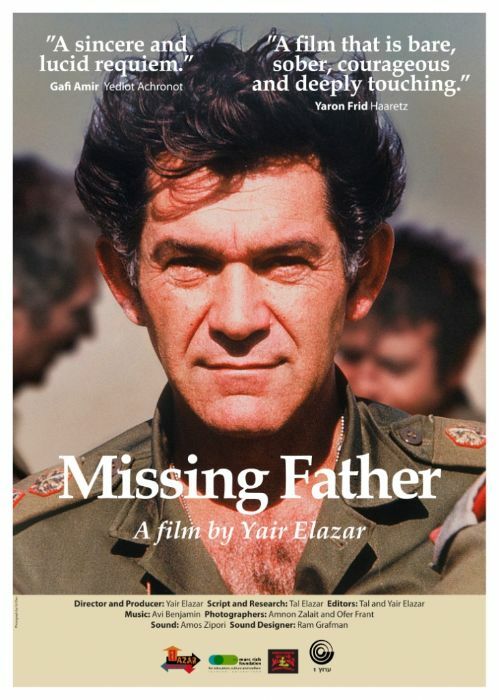 • "..Yair Elazar's film, "Missing Father", broadcast yesterday on Channel 1, was a sincere and lucid requiem. Elazar returned to his dead father Dado, Chief of Staff during the Yom Kippur war that died of heartbreak. In the process, he broke the viewers' hearts...."
• "...In a film that is bare, sober, courageous and deeply touching, the son, who bears a painful resemblance to his father, whose portrait at the height of his fame was printed even on key chains, embarks on a voyage of reconnaissance with the man he lost at age 10, a man that everyone, so it seems, knew better than him.."